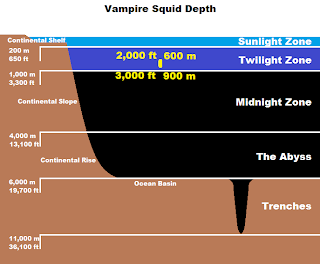 It'd make for a strange scout though, since the vampire squid is found at extraordinary depths of 600-900 metres (2,000-3,000 feet) or even more, where there is scarce light and such low oxygen levels that little else can survive. In fact there are no other known cephalopods at this depth. You know, I really like octopus. A life without the octopus... sounds like Hell. Hmmm. 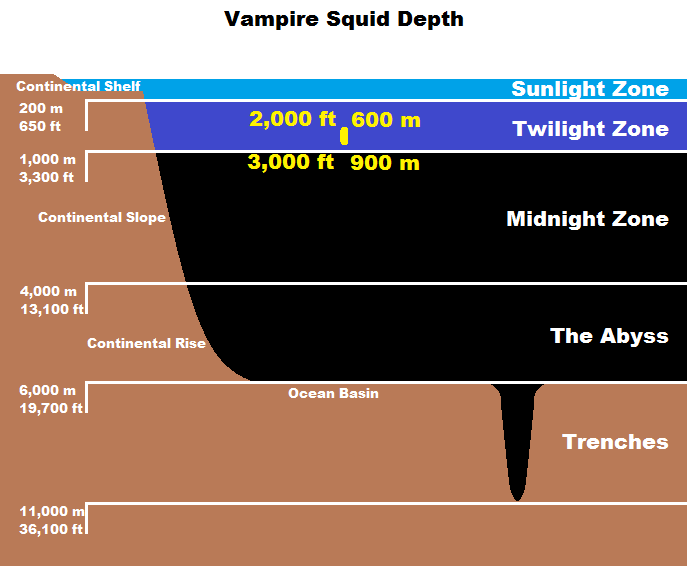 Anyway, how does the vampire squid survive in a place that others can't, and if it's not a squid, what is it? Firstly, the vampire squid has been given its own order: Vampyromorphida. It has eight arms, like octopus, but caped together with a webbing of skin and with suckers only at the further half. The rest is covered in fleshy spines called cirri, that may help in creating a current to draw food toward the mouth. They also have two more long, thin 'velar filaments' with which it can feel the surrounding area and search for prey, or keep in a little pouch when not in use. They're a bit like the tentacles that give squid their ninth and tenth limb, but seem to be appendages that octopus lost millions of years ago. 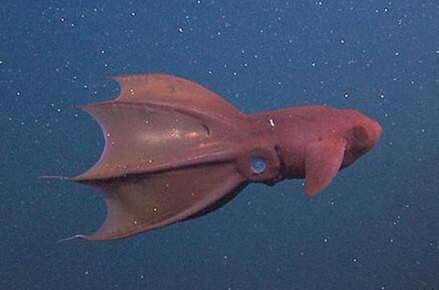 Yes, vampire squid are old, they used to have a lot more relatives in the Vampyromorphid family but now just one is left, in a place where cephalopod upstarts couldn't get at it. 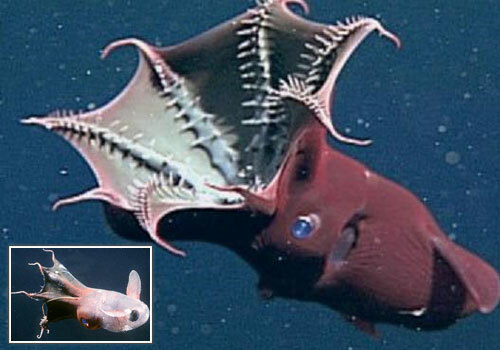 Despite the dark and the long, feely, antenna arms, vampire squid have big eyes. Really big. The entire animal is only about a foot (30 cms) long and half that is all arms, but they have eyes an inch (2.5 cms) in diameter. A twelvth of the entire length, a sixth of its body! If we take the sixth, we're talking the equivalent of humans with basketball eyeballs! People bouncing eyeballs on the floor and throwing it at each other. Imagine that! Don't imagine that. They also have soft, gelatinous bodies, full of ammonium rich tissues that have a density similar to that of the surrounding water, allowing them to maintain buoyancy with minimal effort. Which is good because they also have rather weak muscles, but are still agile enough for a burst of speed due to balancing organs that are quite a lot like the inner ear. When more relaxed, the vampire squid uses fins at the side of its head to slowly 'fly' through the darkness, again requiring minimal effort. Throw in blue blood that takes up more oxygen than that of other cephalopods and gills with an unusually large surface area and you have a creature that can survive the Oxygen Minimum Zone with aplomb. Life in the deep sea is tough, but death is tougher, so the vampire squid uses a variety of strategies to avoid and escape predation. For a start there is the simple matter of colour, it is black or red, both of which are invisible in the deep. Secondly, it's almost entirely covered in photophores. When the vampire moves up to the shallower end of its range it won't be shrouded in blackness, it's surrounded in twilight and just as the vampire has large eyes to make use of the smallest gleam of light, so too do its predators. To combat this, it can emit a bluish colour from the photophores and blend in with its surroundings when seen from below. It also has photoreceptors atop its head, not eyes exactly, but sensitive to movement and shadows above, and it's when that shadow turns out to be something malevolent that the fireworks really begin! No, not guns, it's more that the vampire squid has impeccable control of its bioluminescent photophores, creating a dazzling and maddening display as they flash and glow, tentacles writhing and the actual vampire darting erratically. Deciphering the actual creature behind it all becomes frustrating in the gloom and to cap it all, it can even light up and then diminish and shrink the luminescence to mimic a creature escaping into the distance, while the vampire itself barely moves. All to conserve energy, and particularly effective when predators themselves can't afford to use up energy on a chase. Most cephalopods have an ink sac with which they can squirt a load of dark and confusing ink at predators as they make their getaway. In the darkness of the deep sea however, the darkness of ink is pretty much irrelevent. The vampire squid gets around this by using light instead. When the situation appears particularly dire, it squirts sticky, bioluminescent mucus from the tips of its arms which can stay lit up for 10 minutes, dazing and dazzling the predator while the vampire disappears into the shadows. I don't know how sticky this stuff actually is, but it sounds like the vampire can actually watch its assailant glowing in the dark and casually drift away. Clever stuff! One incredibly odd defense is known as the pineapple posture. Here, the arms are drawn up to expose the jet black underside of the cape. There are no photophores here and the rest of the body disappears inside. The cirri stand out proudly, but are completely harmless. Meanwhile the vampire can light up photophores at the tips of its arms and hold them up, drawing attacks away from the body and toward... well, the tips of its arms, obviously. These can be regenerated if lost, so it's a worthwhile sacrifice. Wow! There's a lot to say about the vampire squid... from Hell! It's such a remarkable and unique creature, I feel it deserves its remarkable and ridiculous name for this alone. It's incredible the amount of adaptation and strategy it has required to survive in its niche. While octopus and squid went about killing off its ancient relatives, the vampire has survived by living life deeper than the deepest of deep sea squid could. Night of the Living Dead! Vampire squid squirt sticky, bioluminescent mucus from the tips of their arms, check out some other squirters at In Your Face! : Squirters of the Animal Kingdom. 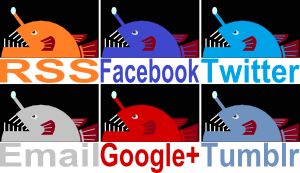 I have been reading your blog chronologically (from the oldest posts) because there is a lot of awesomeness here! I had never imagined that there could be such bizzarre and cool creatures here on this planet! And the Vampire Squid is probably my favourite so far, it seems to have such great abilities... it is a shame that they are endangered by climate changes etc. caused by humans. Wow! Thank you so much for your kind words and all the time and effort to read all those posts. I'm glad you're finding it worthwhile! The Vampire Squid certainly is a very interesting and quietly charismatic creature. Losing them would be utterly tragic! I think everyone who knows about the Vampire Squid loves them at least a little. Haha! It's difficult not to!